Jesus instituted the Lord’s Supper at his final celebration of the Passover with his disciples. The Passover is part of the background for the New Testament sacrament. But the words of institution are actually quoted from Exodus 24. They deal not only with partaking of communion, but also with how you live your daily life. 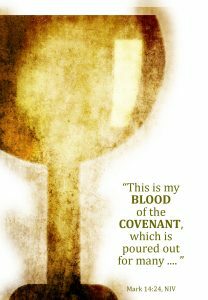 You are covered by the blood of the covenant. The blood of the covenant covered Israel. The people needed to be consecrated before they could approach the Lord. Here the problem of sin is dealt with by the offering of sacrifices. The animals died in the place of the sinful people. The blood sprinkled on the altar, symbolized God’s forgiveness, his acceptance of the sacrifice. The blood sprinkled on the people shows that even their oath to keep God’s covenant can be kept only as they are covered by the sacrificial blood. There is no place for works salvation here. “Before the blood could act for the benefit of the people it had to do its work with reference to Jehovah, and this could scarcely consist in aught else than to make the prerequisite expiation.” (Geerhardus Vos, Biblical Theology, p. 139). Christ covers you by his blood of the covenant. Jesus used the language of this passage as he instituted the Supper, Luke 22:20. The cup represents his blood, which he was about to shed as he offered himself as the perfect sacrifice. He took upon himself the curse of the covenant. The concept of the vicarious atonement is not just a theological reflection of the later church. It grows right out of the language and concepts that Christ used as he instituted the Supper. The people’s promise of obedience sounds glib, especially since you are familiar with their subsequent history. But Christ not only promised obedience, he obeyed perfectly in your place. This meal calls you to a life of renewed obedience, grateful, loving service, to your God. Enjoy table fellowship with your God. You come into the presence of God. Moses, Aaron and his sons, and the 70 elders went up and saw the Lord. God is Spirit, yet he somehow revealed himself in his majesty and glory to his people. You have seen something even more wonderful. You know Jesus Christ, the ultimate theophany. “Yahweh God appeared to the men, representatives of the covenant people, as the God of beauty, majesty, glory, and life. Israel’s God did not appear as a phantom or an imagined reality. He, the eternal, invisible, holy,m and majestic one, presented himself to be seen. . . . Only in Christ, centuries later, is a a higher, fuller, revelation given of the actual presenting of God to his people.” (Gerard Van Groningen, From Creation to Consummation, p. 343). Live in fellowship with your God. The meal enjoyed by Moses, Aaron, and the 70 celebrated and sealed the covenant relationship between God and his people. Jesus appropriately ties that meaning also into his institution of the Supper. The Lord’s Supper includes an element of conscious commitment to the Lord. God invites you into his presence, as you trust in Jesus Christ, the ultimate revelation of the Father, and invites you to a meal. God himself, the holy Creator, Lord and Judge of the universe, invites you to have table fellowship with him. Walking in fellowship with God involves living in obedient faith. God graciously makes his covenant with you—and summons you to respond. “[T]he covenant of God imposed obligations also on those with whom it was made—obligations, not as conditions for entering into the covenant (for the covenant was made and based only on God’s compassion), but but as the way the people who had by grace been incorporated into the covenant henceforth had to conduct themselves (Gen. 17:1-2; Exod. 19:5-6, 8; 24:3,7…).” (Herman Bavinck, Reformed Dogmatics, Vol. 3, p. 204). The meal to which the Lord invites you symbolizes the saving work of Jesus Christ. Through his blood shed for you, you stand purified in God’s presence. He invites you to table fellowship with himself—today, and for eternity in the new heavens and earth.